Apart from simply affecting the numbers, classifying tsunami victims as missing or dead is affecting the survivors - at least in India and especially Andaman. Apparently, monetary aid is given to victims' families only if the person is dead (in other words if the body has been found). Civil rights groups have begun to pressure the government to declare missing people dead in the next few days and awareness of this issue will only help their case. Of course, there would becases of people falsely reporting their family members missing - but a genuine victim not getting aid is only worse. Further, in a small island one could simply use peer pressure and social monitoring to make sure such cases are reduced. *UPDATE*: According to the the Australian, common law require(s) a person to be missing for seven years before he or she could be declared dead. In addition, what is outrageous is the gradually increasing reports of orphaned kids getting smuggled or kidnapped. I hope that aid agencies speed up the process of finding these kids a home and not wait till basic amenities are disbursed (doing them parallely will surely help). I think it might be time for more aid to be directed to organizations who are specifically doing this. Apart from SOS Children's Relief (See Tsunami relief effort link above), what are the organizations doing this (especially in Indonesia and Thailand) ? This is new post, but since I wanted Tsunami Relief to remain the primary post on the blog, I have adjusted the dates to ensure this comes up below the main post. (Via Aditya) This was a post made by an Indian nauralist on a Princeton mailing list on Dec 4th, 2004. Absolutely surreal. The South-East Asia Tsunami and Earthquake (SEA-EAT) blog is a great resource for information on what is happening in the aftermath of the Tsunami disaster. Among other things, this blog contains information on country-specific helplines, organizations that are performing relief work, places where you can donate money, and of course information on, and pictures of the Tsunami. I encourage people to check this out. Reuben will put together a list of agencies that are looking for volunteers and donations real soon, but for now this website contains a list of URL's and addresses that are accepting donations either online or through cheques. On a different note, it is indeed heartening to observe the overwhelming response to the relief efforts, and a willingness to help from so many civilians in some of the affected countries; as well as the speed with which NGO's and other agencies have organized themselves to react to this tragedy. This journal entry on the Association for India's Development (AID) website is a very inspirational account on how various relief organizations are collaborating with one another to organize, plan, and handle the relief operations in Tamil Nadu, India. Folks, I have been thinking about how we can constructively help with the relief efforts in the Tsunami-stricken parts of South and South East Asia. Some of us can volunteer on the ground, though I urge you to check with authorities and charities to make sure you are being helpful and not being a hindrance. For the most part though, I think we can contribute financially to help fund the relief effort. So, I am going to compile a list of sites/people/agencies looking for contributions to help with relief. I will also try and compile as comprehensive a list as possible for volunteer opportunities, news roundups and so on. I have already collected a bunch of links, but I need a lot more. So, this post is an appeal to request those of you who have ideas, links etc to please send them to me as soon as possible. I hope to make a comprehensive post sometime tomorrow (29th) evening or 30th morning, Eastern Standard. Thanks in advance. UPDATE: I have been asked by more than one person whether it might be worthwhile for ZS to collect money (via paypal) and then distribute it to a particular agency. My initial reaction would be skeptical since it will involve being responsible for someone else's money and I think relief agencies are logistically better equipped to handle something like this than any of us. On the other hand, we might be able to get it to the ground easier. My personal preference remains to direct people to sources they feel comfortable donating to, but if you feel strongly either way please let me know either via e-mail or via the comments section on here. UPDATE: Folks, I am absolutely knackered by jetlag, so I will post the links tomorrow first thing in the am rather than do something incoherent tonight. Apologies for the delay. Sorry I went off the radar for such a long time. I haven't really had the time to trawl the Net or even come up with much to say. But I did come across these two brilliant compilations by David Brooks in the NYT (published as Part I and Part II). Here, Brooks lists some of the best essays written in 2004 as part of a self-created award called the Hookie (named after public intellectual Sidney Hook). Most of you may have read some of these essays, but I'll guarantee you this, they are all worth a second, third and fourth read. Happy holidays and a stimulating 2005 to everyone. I never thought I would live to see the day a tsunami hit the coast of India. What an absolute freak of nature!! And even more so when you realise it happened exactly one year to the day after the quake in Bam, Iran. The current death toll seems to suggest 1000 dead in southern India, 1500 dead in Sri Lanka, 250 dead in Indonesia, about a 100 dead in Thailand and so on. The tidal wave even hit parts of Kerala somehow and 2/3rds of the Maldives are under water. I fully expect the toll to go up much more as the govts begin to account for missing people. From everything I've heard, Madras was very badly hit and both Marina beach and Elliott's beach dissapeared for a while as water crashed in almost a kilometer inland. I hope all ZS readers based in Madras (and there are several) are all safe as are your friends and family. Not sure there's much else I can say at this point. Folks, greetings from Switzerland. Just got online for a little while to wish every one of you a Merry Christmas. In keeping with the spirit of Christmas, I celebrated the day by watching the British zombie/horror spoof, Shaun of the Dead. And a very uplifting movie it was :) Highly recommended. So the latest and final 2004 Big Mac Index was released by the Economist this week. Continuing the trend of past BMI, China is at the bottom of the list, with a US $1.26 burger. This implies that the yuan is 58% undervalued relative to its Big Mac dollar-PPP. On the same basis, the euro is 25% overvalued, the yen 17% undervalued. So as we wind down the year, any predictions from the smart folks who read/write this blog? Will the US dollar recover from its slide in the first half of next year? Will the Chinese revalue the yuan in 2005? A euro costs about US $1.34 (the cost of one Big Mac in China plus change! ), so which way will it move in 2005? Is the freedom of speech the freedom to offend? The right to freedom of speech is still relatively new and we are like adolescents, insufficiently mature in how we should use it. The article also points out that, in the arts, any publicity tends to benefit the artist - another reason for the observation Mr. Walker (author of a book on Art and Outrage) makes. There remains an important distinction that appears to be absent. If the sole purpose of one's expression (speech or not) is to offend the other, and nothing more, then it is indeed a sign of 'immaturity in the use of the freedom of expression'. Of course, one could justify all sorts of reasons other than intended offense as the objective - this is what makes the issue so subjective. By the same token, if the sole reason for silence is driven by the desire to not offend anyone, then we are not far away from 'immaturity in the use of the freedom of expression.' In this case however, it is upto the individual on how much silence affects his or her happiness. For most people, there is clearly a balance based on factors such as where you are, who you are with, how important is it for you to express your point and does it actually encourage an exchange of ideas (of course, you wouldn't know this unless you expressed what you want to). To me, It appears that this balance is tilted more towards 'political correctness' than should be. Finally, there will always be people (those who live off the expression of ideas) that will benefit from social trends of what gets covered. Why then does offensive material get on an average more coverage than an average non-offensive piece? Is society, in its desperate craving for political incorrectness, turning to artists? Is it the case that more politically correct societies are also societies where offensive art gets more coverage? We consider ourselves as in competition with China for leadership in the new century. That's our focus and frankly, you have made it very difficult for us to deal with you. We find your approach to international affairs ridiculous. The invasion of Iraq was insane. You've encouraged the very things you say you were trying to fix - terrorism and instability. Your attitude to Iran is ridiculous. You need to engage with Iran. We are. We are bemused by your hypocrisy. You lecture the world about dealing with dictators and you deal with Pakistan. We are very sorry for your losses from the 9/11 terror attacks. Welcome to our world. You threaten us with sanctions for not signing the non-proliferation treaty, but you continue to be nuclear armed and to investigate new weapons. You expect us to neglect our own security because you want us to. We don't care about sanctions. Seems about right. Folks in India and East Asia generally see the US campaign in the Middle East as a misguided lark. Any reactions, or other reports on this delegation? I have been looking out for artists who are trying to do new things with Jazz and here's someone who I came across - Django Bates. He's been a creative force in the UK Jazz scene, mixing classical and rock influences with Jazz. The Times has called him "simply prodigious talent" and you can find BBC and The Guardian raving about him on his website, where you'll also find a few songs. p.s. Zappa Fans might find the guy particularly impressive. A follow-up to Reuben's post. I was browsing through Bernard Lewis' introductory book on The Middle East at this Italian restaurant called Di Napoli Pizzeria. The restaurant happens to be one of these inconspicuous places on a street I have never been on before, and I thought I would check it out. Anyway, I found this little piece of trivia in the first chapter. Strictly speaking, Persia, or Persis, is the name not of a country nor of a nation, but of a province - the southwestern province of Pars or Fars, on the eastern shore of the gulf which takes its name from it. The Persians have never applied that name to the whole country. They have, however, used it of their language, since the regional dialect of Pars became the dominant cultural and political language of the country in the same way that Tuscan became Italian, Castilian became Spanish, and the dialect of the Home Counties became English. portion of Pars is actually adjoining the Gulf. In any case, a significant section of the Arabian Peninsula is definitely on it. Renaming gegraphic regions can of course be quite a sensitive issue. A few weeks back, the Iranian government banned the sales of National Geographic for using the term in maps, and even banned National Geographic journalists from entering the country. National Geographic has issued a Press Release. accurate, apolitical and objective. Decisions regarding nomenclature assigned to geographic places, locations, bodies of water, and the like are checked against a number of external entities, including the Board on Geographic Names, recognized reference books such as encyclopedias, dictionaries, and geographical dictionaries. The Arabian Gulf is recognized as a variant naming of the Persian Gulf by many such entities. In fact, the Society first used the primary-secondary dual listing on a Middle East map published in 1991. Brad DeLong thinks out aloud about the politico-economic arithmetic of China. I reproduce Brad's post in full. Thinking that the long-run value of the renminbi is two-thirds of its present value leads to the conclusion that at the moment China is spending about $40 billion a year--2.5% of GDP--on its currency-support program. This sum is not recognized in China's budget or on its balance sheet. But it is very real. Is this a big number--one that deranges China's internal political economy and cannot be sustained for very long? Or is it a small number--a cheap way to buy some insurance against shocks that would otherwise produce large-scale urban unemployment? I cannot decide. ZDNet reports that Forefox has crossed 10 million downloads of Ver 1.0. IE's share has dropped to less than 90% while Firefox's share has grown to 7.2%. Microsoft disputes these numbers saying they dont register corporate users. On Zoo Station, Forefox's share has gone up from 17% a couple months back to 23% today. 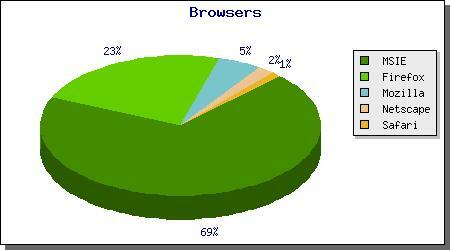 To the 69% of ZS readers who still use IE, I ask why? Why aren't you shifting to a superior, safer browser? What're more, Forefox gives you some seriously cool extensions and yes, IE View lets you shift to IE should you run into idiotic sites that don't work well with Firefox. Idea Cellular India has new owners as Telekom Malaysia and Singapore Technologies Telemedia have taken over AT&T's stake in the company. The rest of the firm continues to be owned by the Tata and Birla groups. Interestingly, the sellout happened in the wake of Cingular's $41 billion buyout of AT&T Wireless. Clearly, Cingular wants to consolidate its American footprint and is getting out of any business seen as non-core in this context. Even as the western giants exit India -- last week France Telecom sold its stake in BPL to the Essar group -- the south-east Asians are muscling their way in. In the case of France Telecom, they clearly need all the money they can get because of the money they flushed down the 3G drain. It's interesting nevertheless that Singapore are Malaysia see opportunity where France and the U.S. don't. UPDATE: Meanwhile, the Commies want TRAI disbanded. If you ever needed evidence these guys were cuckoo, this is it. Telecom is pretty much the only core sector where India is getting to be world class, and these jokers want to ruin that because they want to 'protect' the incumbent, BSNL? The buggers!! [From Eugene Letuchy] Steve Sailer writes The American Conservative magazine cover story on the correlation between Bush's vote in 2004 with the white total fertility rate. Given the degree to which the swing states affected the campaigns and the outcome in this election, overall nation-wide statistics might not appear very significant, but lost in the arguments about the role of values in Ohio might be the role of nation-wide demographic trends. The degree of correlation is remarkably high (0.86), even if the statistical sample is small. Steve Sailer argues why the correlation might be more than statistical. Couples attempting to raise children in a big blue city quickly learn the truth of what bond trader Sherman McCoy’s father told him in Tom Wolfe’s Bonfire of the Vanities: "If you want to live in New York, you’ve got to insulate, insulate, insulate." Manhattan liberals all believe in celebrating diversity in theory but typically draw the line at subjecting their own offspring to it in the public schools. With Manhattan private K-12 school tuitions now approaching $25,000, insulating multiple children rapidly becomes too expensive for all but the filthy rich. The late socialist historian Jim Chapin pointed out that it was perfectly rational for parents with more children than money to ask their political and cultural leaders to help them insulate their kids from bad examples, even, or perhaps especially, if the parents themselves are not perfect role models. (Via Cogwheels) Every year, Shell and The Economist conduct a writing contest and this year's topic was 'Import workers or export jobs?' This year, the prize was won by Claudia O'Keefe from Frankford, West Virginia for her first-person essay titled 'The Travelling Bra Salesman.' Here is the synopsis of her essay which can be read in full here. When a former middle-class professional is stranded and falls into poverty in job poor West Virginia, she finds parallels between her depressed local economy and the debates on outsourcing and immigration raging throughout her country and the world. She remembers an important lesson taught to her by her stepfather decades ago, a traveling salesman who cruised Route 66 with a trunk full of bras, selling to variety stores and making a good living for his family until his way of life was threatened. Know when to let go of the past and reach for the future. The question we face is not whether it is good or bad to import workers or export jobs. The problem is that society has hit an emotional road block, with pro-worker and pro-business factions stubbornly pitted against each other, completely inhibiting progress. Many jobless are angry at the withering of something considered a natural right, The American Dream. Nothing can be solved until we acknowledge that one dream is ending and another waiting for us to recognize it. Only then will we open ourselves to solutions we haven’t yet considered or invented, to a more inclusive and thrilling successor to outmoded 20th century ideals of employment and immigration. It is not The American Dream we should seek, but The Global Dream. Yesterday I came across Jottings, a blog that lists among other things, the 100 oldest currently registered .com domains. Most of these were registered in the period 1985-87. Among the biggies, the list includes Northrop, Xerox, IBM, Sun, Intel, Lockheed, 3Com etc. Have a look. It's interesting to see how many of the big firms of today were prescient enough back in 1985. The Economist has published its list of the year's best books. The list includes The Lambs of London by Peter Ackroyd, Maximum City by Suketu Mehta, Chain of Command by Sy Hersh, the 9/11 Comission Report, Wodehouse: A life by Robert McCrum, Why Globalization Works by Martin Wolf, The Fortune at the Bottom of the Pyramid by C.K.Prahalad and Chronicles: Volume One by Bob Dylan. There is also a separate section on books written by writers from the Economist itself. Dan Gillmor, the fantastic technology columnist at the San Jose Mercury News and author of We the Media, announced today that he was leaving the paper for an as yet unknown "citizen-journalism project." I do hope he will continue to write on his well known blog even as he heads into the world of start-ups. In the meanwhile, Andrew, why do I get the feeling you more about Dan Gillmor's new project than anyone in the media? Care to share or this all too hush-hush? Since the blog is named after a U2 song, I might as well throw is some more U2 news in here, hey? So, MTV showed a 30 minute documentary on the secret Brooklyn concert as part of a new program called MTV Jammed. They will replay it again on the 14th at 2 am EST for those of you who missed tonight's show. Was pretty awesome since it also showed little bits of U2's little traffic stopper through Manhattan, including a shot of the guy who was behind me in line delivering 4 Guinesses to the band. In addition to the MTV shows, iTunes has the concert EP (4 songs) available for sale at $3.96 and boy, the soundboard has incredible sound quality. I also see where U2 are headed now. They are probably going to put up soundboards from every single concert from their upcoming world tour up for sale on iTunes, thereby opening an entirely new revenue stream for the band. This on top of the constant playing of the Ipod commercial which has sent the album to No:1 status in 24 countries including the U.S. and the U.K. This tie-up with Apple is beginning to make more and more sense to me now, beyond the fact that Bono's New York apartment (the San Remo) was bought from Steve Jobs. On another note, Dimebag Darell, the lead guitarist of now defunct thrash metal band Pantera (a band I truly hated) was killed in a senseless nightclub shooting in Ohio. Whats eerie about the killing is that it happened exactly 24 years (to the day) after John Lennon was killed by Mark Chapman, another crazed fan. Futuristic transport system - not so far in the future? With transportation woes and environmental concerns both on the rise, this personal transit system appears to be an attempt in the right step. It has even managed to garner interest among governmental agencies (e.g., with the new jersey state! - see link on their webpage). At the bottom of the skywebexpress webpage, you'll find a simple and short demo - check it out. On the downside, a range of operations and scheduling problems, especially in populated areas, stare straight at you while watching the video; but i am assuming these guys can figure that out. I remember the time a few years back (around the time of the 3G auction madness in Europe) when everyone was getting ready to watch full-length movies on 3G handsets. This, in turn, was going to drive usage and windfall revenues for the operators. Of course none of this materialised, to the great amusement of skeptics like Andrew and me, and 3G is still enduring birth pangs and will in all likelihood be bypassed by technologies like WiMAX. Besides the obvious novelty value, I really dont see how people can be convinced to watch 3 hour movies (or a shorter Hollywood film) on a tiny mobile phone screen and pay money for the service. Needless to say, I'd also love to see a handset whose batteries can last through the length of a Bollywood movie. It seems like the French understand the changing geopolitical balance of the world better than most other western powers. Katrin Bennhold reports in the Herald Tribune on how the French have been aggressively courting India and China, though this particular story focusses on India. Since Chirac visited New Delhi in 1998, France and India have maintained a regular strategic dialogue, with the French leader never failing to mention India as one of the world's multiple poles, along with America, Europe and China. When most of the Western world expressed outrage at India's nuclear testing in May 1998, Chirac's response was distinctly moderate. Last year, he backed India's longstanding ambition to join the United Nations Security Council as a permanent member. But economic ties have not matched the intensity of political sympathy between the two nations, a shortcoming that Loos says he wants to address during his talks in Bombay and New Delhi. As the ninth largest foreign investor in India, France ranks well behind the United States, Britain and Germany. French nonmilitary exports, worth €1 billion, or $1.34 billion, per year, account for only 1.2 percent of Indian imports, a share Loos wants to triple over "the next few years." The figure for total French exports is only slightly higher - 1.4 percent of Indian imports, according to the Indian Commerce Ministry. On the table for discussion are a host of deals across several industrial sectors, most notably a long-awaited sale of 43 Airbus A320 planes, worth about $2 billion, to Indian Airlines, and the sale of six military Scorpene submarines for $2.5 billion. In some ways, India may become a more important economic partner for France than China in the long run, analysts say. India accounts for 20 percent of world software exports, and some of its high-technology and pharmaceutical companies have become global brands. "India is ahead of China in the sense that it has produced truly global brands," Loos said. "China hasn't." India is unique among developing countries with what Jaffrelot calls an "almost post-industrial" structure: The booming service sector now accounts for half of gross national product, with manufacturing and agriculture each making up a quarter. Ten years ago, the share of services was only 38 percent. With its highly trained, English-speaking work force and sophisticated technological infrastructure, India has some advantages over China. "In the years ahead, India will be more important as a place of scientific research," Jaffrelot said. "If China will be the world's workshop, India will be its laboratory." I'm going to toot my own horn very briefly, but a new site by my students has just gone live at Chatter Garden. It's a site that discusses regional politics and public affiars for HK and China, so I welcome anyone who wants to visit or contribute. It's part of the growing trend of citizen journalism, and this is an attempt to try it for Hong Kong. My first post is about the story that is hot right now in HK - the demolition of perfectly good, fully built and finished high rise buildings because the developer feels they can get better with even higher buildings built in a luxury style. This was a botched public housing estate, and there is public outcry over the sale of the property and flats for a price below market value, providing perhaps a HK $6 billion (US $800 million) windfall. See for yourself whether this is a scandal. What with the Scobleizer blog and the sql junkies blogs, I was wondering when Microsoft would come out with their own public blog service. So, it is finally here. Microsoft is launching MSN Spaces on Thursday. Microsoft might be able to attract some of its established user base and communities from MSN and Hotmail to MSN Spaces, but it remains to be seen how well Microsoft is able to leverage its presence in various other disparate domains from messenging to online music. Microsoft is closely integrating MSN Spaces with its Messenger and Hotmail programs, with the idea that people will hop from one Microsoft product to another for online communications. For example, users can set up a system that alerts friends on MSN Messenger when they have updated their Web journals. If a blogger chooses to limit access to his or her Web journal to a select group of guests, those people will need to use Microsoft's "Passport" to log in. The most common way to get a Passport login is to sign up for a Hotmail or Messenger account. For materials you post or otherwise provide to Microsoft related to the MSN Web Sites (a "Submission"), you grant Microsoft permission to (1) use, copy, distribute, transmit, publicly display, publicly perform, reproduce, edit, modify, translate and reformat your Submission, each in connection with the MSN Web Sites, and (2) sublicense these rights, to the maximum extent permitted by applicable law. Microsoft will not pay you for your Submission. Microsoft may remove your Submission at any time. For each Submission, you represent that you have all rights necessary for you to make the grants in this section. To the maximum extent permitted by applicable law, Microsoft may monitor your e-mail, or other electronic communications and may disclose such information in the event it has a good faith reason to believe it is necessary for purposes of ensuring your compliance with this Agreement, and protecting the rights, property, and interests of the Microsoft Parties or any customer of a Microsoft Party. I do not plan on putting anything else on my space until this is cleared up, though. I'm a firm believer of being held to what I signed. What I signed says something more than the lawyer accounts for. Better safe than sorry, as far as I'm concerned. Yesterday, the New York Times reported that after 23 long years in the business, IBM plans to sell its PC unit to concentrate on higher margin businesses. While its hard to imagine a computer world without the IBM PC, what is even more interesting is who IBM PC's buyer may be. If all the rumours are true, Lenovo Computers of China (formerly Legend) is ready to pony up the $1-2 billion required to complete the purchase. Lenovo, part owned by the Chinese government, is already the dominant player in the Chinese market, though they have been facing up to increasing competition from HP and Dell. Buying IBM will clearly give Lenovo a greater hold over the world's third (soon to be second) largest PC market. That said, Lenovo still faces a problem with global markets. It has a tiny 2.6% of the world PC market. Buying IBM will give it a 8% share, still well short of Dell and HP. Lenovo also has a brand recognition issue globally, something that the association with the IBM brand may help solve. Nevertheless, it is interesting to watch a major Chinese company muscle its way into the top echelons of the hardware market. You've heard of Pixar, Dreamworks and Industrial Light and Magic by now. Their animation and creative talents have set the trends for much of the Hollywood film industry in the last decade. But now that elite club has an emerging Asian counterpart. 2005 will be a breakout year for one of Hong Kong cinema's big success stories - Centro Digital Pictures. Their latest project with Columbia Pictures, Kung Fu Hustle, is ready and loaded for movie theater release this December. From reactions to initial screenings, this thing is going to pack a whallop. Set in 1940's Shanghai, it's an high octane tribute to chop-shlock kung fu movies and action comedy directed by and starring Stephen Chow, one of the biggest stars in Hong Kong and Asia. Describing Chow to those who have never heard of him is always challenging. Imagine Jim Carrey stirred up with Jackie Chan, the shape of Bruce Lee, a dollup of Robin Williams, and a dash of Moe, Larry and Curly, and you start to get an idea. So what about Centro Digital Pictures? I visited their offices in Hong Kong's Cyberport, a special high tech facility in the south west corner of the island, to get a first hand look at their creative team. While their "bread and butter" has been CG animation for advertisements and video games, their forays into feature film have been a series of successes. Founder and CEO John Chu is particularly proud of their 1998 film Storm Riders, which was a breakthrough in CG for Hong Kong film and set box office records. Shaolin Soccer was their 2001 megahit with Stephen Chow. The over-the-top special effects combining sport and martial arts were expertly blended by the creative team at Centro. That, and a storyline of Bad News Bears meets Seven Samurai, had audiences mesmerized. And to drive it all home, they also did the special effects for Tarantino's latest tribute to the Shaw Brothers, Kill Bill. The computer workstations at Centro are covered with miniature action figures, comic books and other objects of creative inspiration. But the interesting thing is that nearly all the talent appears to be local - young, thin, bespectacled and lanky Hong Kong kids. One clutches a pillow like a five year old kid, while she's hunched over the keyboard and digital drawing pad. Another in jeans and black T-shirt slouches back in a zombie-like state in his chair while scrubbing through a series of animation frames of a pink cartoon creature. When I asked animation director Tommy Tom about the prevalence of Hong Kong locals, he said many, like himself, had studied in Canada's film or animation schools. Places such as Sheridan College in Toronto have been a great training ground for Hong Kong's next generation of filmmakers. It's one of the interesting side effects of the 1997 handover, when large waves of Hong Kongers immigrated to Canada, Australia and the US as a hedge on the reversion to China. As an aside, this should convince Hong Kong government, more than anything else, that diversity for Hong Kong's education system and college community is a good thing. Just this year, Shaolin Soccer was released in the US with English language trailers and a marketing splash. CEO Chu says the reason for the two year delay in releasing it in the U.S. was a confusion over how to present the slapsticky, fast paced movie to Western audiences. American moviegoers have a reputation for hating subtitles. Whether this is a truism or not, is questionable. But overdubbing Stephen Chow's frenetic movie style would certainly ruin the experience as well. This state of limbo will not be a problem for Kung Fu Hustle, since Columbia Pictures has had American audiences in mind from the beginning. While some reviewers have expressed doubts whether all the references will be appreciated by audiences not familiar with the Hong Kong kung fu genre, it will be the biggest stage for Centro. And so far they have only had successes. Do you know what Trinitite is? Well, you're about to find out. Over at Kuro5hin, freelance writer Roger Williams has crafted a beautiful essay about America's use of atomic bombs in 1945. It is both informative and moving and, as a bonus, it is very well written, and I do mean very (I mention this only because the quality of writing is far above the average for a Kuro5hin article). Set aside some 20 minutes to read it, and comment freely on this blog. The Economist points to some of the more interesting numbers that emerged out of the American presidential election. People worth $1m-10m supported Mr Bush by a 63-37% margin, whereas those worth more than $10m favoured Mr Kerry 59-41%. What does that translate into? The Republicans are the party of the rich while the Democrats are the party of the super-rich? A friend of mine got this amended contract in the mail from State Farm, the giant insurance company. C. Any accidental or intentional detonation of any Nuclear or Radioactive device. As my friend said, what does State Farm know that we don't? Or is this just a standard clause these days? Via Slashdot, I found Xcelis, a company that offers unlimited calling on your mobile phone within the U.S. and Canada. Very briefly, you pay $9.99 per month for the package and depending on your carrier, you call a designated number which gives you a new dial tone. Any call you then make is then routed over the Internet or over POTS. Sounds great so far. Why would you use this service though? It seems like you already need a service provider to access this service and most providers in the U.S. provide with you X minutes for unlimited calling. So, if you already have unlimited calling, why would you use this service? Okay, it makes sense if you have a pre-paid card, which you can buy for as little as $10 and is valid for a year. You can then use the Xcelis plan on top of a pre-paid card, I presume. However, since most subscribers in the U.S. use calling plans, I fail to understand the target market. I imagine you would also have to pay for incoming minutes since there is no way to get to your specific phone unless of course you change your number. Anyone use this service at all? Am I missing something here? Will cell phone companies beat this challenge off by simply increasing the number of minutes on each plan? UPDATE: From their FAQ -- "To use this service you MUST make sure that you have unlimited mobile-to-mobile calling activated on your wireless service calling plan." Errrmmm, whats the point then? To call landlines? The BBC has an article today that announces that the word 'blog' has been picked as a top term for 2004. The article goes through various blog-based statistics, Merriam-Websters definition of the term - "a Web site that contains an online personal journal with reflections, comments and often hyperlinks" (interesting, that last one...), and closes with what might someday prove to be a key socio-technical phenomenon: "In many repressive regimes and developing nations, blogs have been embraced by millions of people keen to give their plight a voice". Cogito cogito ergo cogito sum (I think that I think, therefore I think that I am) -- who else, but Ambrose Bierce.